»Visit Lavasa – The Hill Station That Resembles An Italian City! Visit Lavasa – The Hill Station That Resembles An Italian City! Many times in our life, watching certain scenes of Hollywood movies makes us wish we were there. Those picturesque landscapes, vibrant cities beside clear blue water bodies look so romantic and picture perfect! Even Bollywood movies shot at those beautiful foreign lands leave us craving to visit those places. But alas, if only things were that easy! However, one place that has come closest to such a dream-like destination is located right here in India. And what's more, it is located just 187 km from Mumbai! Lavasa, the first planned hill city of India is located close to Pune, at a distance of about 60 km. The city's landscape is technically inspired from a town in Italy named Portofino. 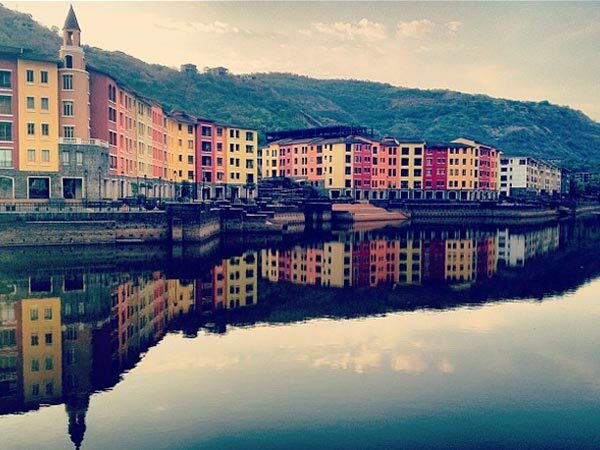 Similar to Portofino in terms of the looks and design, Lavasa has a street next to a marvellous clear lake, with vibrant buildings lining up the street. Just a look at this town will certainly make you fall in love with its beauty! Lavasa has a tropically pleasant weather, since it is a hill station perched at an elevation of around 2000 ft. But Lavasa is exceptionally best during the monsoon and winter months, when the weather is cool, breezy and beautiful. Monsoon falls between July to September while winter is between the months of October to March. You can stop at these places on the way to the beautiful city of Lavasa. Navi Mumbai is also a planned township that acts as a gateway to Mumbai. Suburbs like Kharghar, Vashi, Uran, Mahape etc., are part of Navi Mumbai. It is situated at a distance of 22 km from Mumbai. There are quite a few places of interest in Navi Mumbai like Wonders Park, Central Park, Parsik Hill and Pandavkada Waterfalls. Wonders Park has a unique attraction. It has the replicas of the seven wonders of the world. It also has a kids' friendly play area. The entry fee for children is Rs 25 and for adults, it is Rs 35 only. Located at a distance of 46 km from Navi Mumbai, the Adlabs Imagica Theme Park is the ideal stop for the entire family. It has exclusive rides to play with your family, friends and thrill rides like Nitro or Scream Machine. The park is a well-serviced place with a resort, restaurant, and additional services like packaged trip from Mumbai to the Theme Park. The park remains open from 11.30 AM to 6.30 PM. Lonavala is a beautiful hill station, located about 26 km from the Imagica Theme Park. It is the most sought after hill station, especially by the people of Mumbai and Pune, since it is packed with lush green places to visit. Lonavala is favoured even by the trekkers because of the many peaks and forts such as Tiger's Leap, Rajmachi Fort, Amrutanjan Point, Duke's Nose, etc., which serve as great places for trekking. The hill station is also filled with many picturesque valleys, dams and caves like the Karla and Bhaja Caves. Kamshet is another hill station, with a backdrop of the majestic Western Ghats. It is one of the very few spots of paragliding in India. So for all the adventure bugs, this is the place you need to be! Apart from being a place for paragliding, Kamshet has intriguing places of interest such as Bhairi Caves, Bedsa Caves and Pawna Lake, which is an artificial lake created by the Pawna Dam. A few kilometres before reaching Lavasa, you will come across the Temghar Dam near the Mulshi Village. It is a gravity dam, which means that the dam cannot be overturned by the force of water, due to gravity pulling the dam downwards. The dam is built over the Mutha River. The view of this beautiful dam can be witnessed on the way to Lavasa, on the Temghar-Lavasa Road. The city of Lavasa is like none other. Most of the street names are inspired those in the Italian city Portofino. Dasve, the village that has been replaced by Lavasa is now known as Dasve Boulevard. The streets are called Celosia and Thicket, named after the ornamental plants. Since it is such a planned out city, tourist activities at Lavasa are also planned. Permissions from the tourist authority need to be taken for a professional shoot at Lavasa. The luxurious city of Lavasa has much to offer. Water sports like jet skiing, kayaking, or just a relaxed cruising can be done on the Lavasa Lake. There is an arcade filled with entertaining games like electronic darts, neo arcade, to name a few. There is a country club where you can stay in and simply enjoy the breathtaking view of the entire city of Lavasa. Camping at Lavasa offers a new experience. Unlike the kind of camping done in the forests or trekking places, camping at Lavasa involves interacting with nearby villagers, rappelling, raft-building, archery and even yoga sessions if you're interested. Group activities like mad-ads, collage making, etc., are also encouraged in this camp. All this will be available as packaged services from the tourist authority of Lavasa.